Shooting of two former colleagues on live TV by an ex-reporter yesterday. While the event is spectacular, the Bloodbath Formula here will be likely be weak because of the low number of casualties. 1. Pallas semisextile Pluto; Pallas ruler Jupiter widely/indirectly sesquiquadrate Pluto. 2. 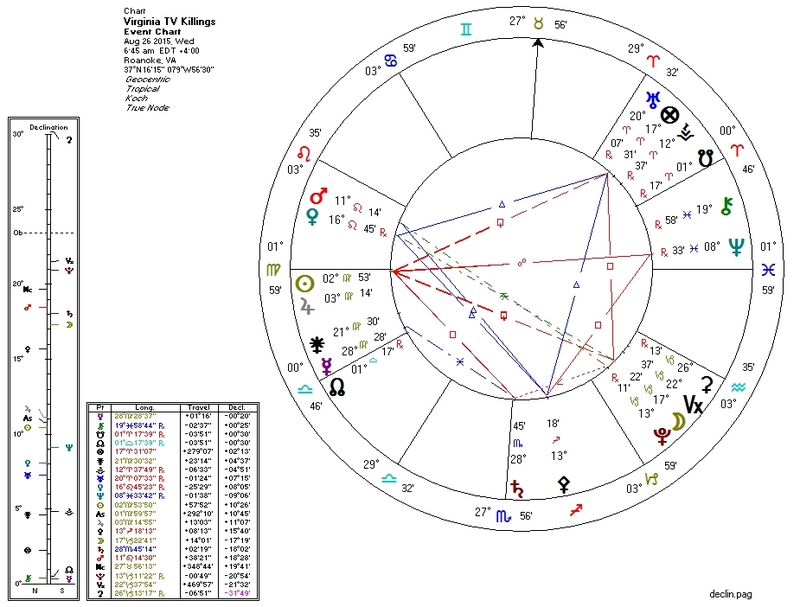 Venus in Twelfth House; Venus ruler Sun opposite Neptune. 5. Sun widely/indirectly sesquiquadrate Pluto. The Sun-Jupiter conjunction at the Ascendant reflects the very public nature of the event. America has always had guns, but apparently has not always had semi-regular mass-shootings. What's different now is the popularity of physician-prescribed psychiatric drugs, and a total unwillingness by both government and mainstream press to address the underlying problem. I have not yet seen reports that this particular killer was on such medication, but the vast majority of these killers are.